Ceramic flower making takes a bit of time and practice. I developed the skill at Coalport China Museum using ancient techniques of bone china flower making. Bone china is a very sticky clay so you use oil such as sunflower oil on your fingers to stop it sticking. It is very soft and can only be sculpted into tiny or palm of the hand size flowers. 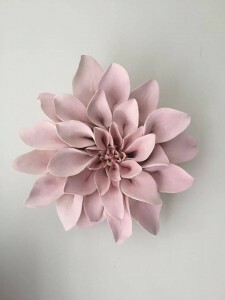 You can make flowers out of any clay with a bit of practice. I believe I could teach anyone to make clay flowers. 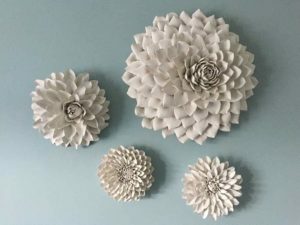 Below are some ‘how to’ guides and videos showing you how to make ceramic flowers using clay. The techniques will work with any clay so can be tried using the air drying clay or other clays you may wish to work with. I am often asked if I do tutorials or classes and from people all around the world. So with today’s technology I can offer online tutorials. All you need is an internet connection and one of the video conferencing services like Skype or Whatsapp video. I would happily teach one person or a group of people. 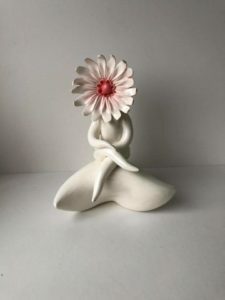 To learn more about my online ceramic flower making tutorials click here. Many people use my online tutorials below but still struggle. If I can see you making the flowers I can see exactly where you are going wrong. To learn how to make flowers using my online tutorials and videos on YouTube, read on. 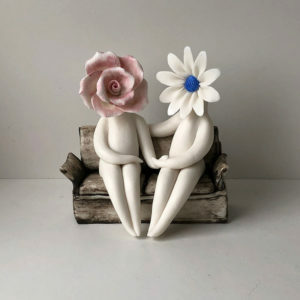 Flowers can be made out of any clay with a bit of practice. 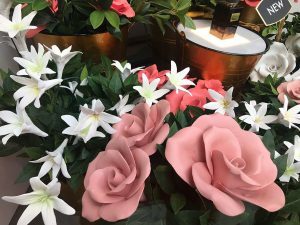 Below are some tutorials on how to make flowers with clay. Below these you can watch videos of me making clay flowers. I have got a few videos on YouTube which you can see below. 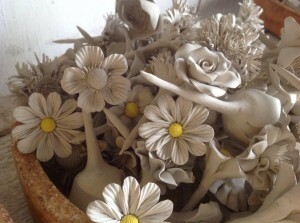 Below are videos of me making bone china flowers at Coalport China Museum in Shropshire. If you really want to become an expert in flower making you should start with bone china. Bone china is the softest and most difficult clay to sculpt with. However for flowers its the easiest medium to use. However you can only make small to palm sized flowers. 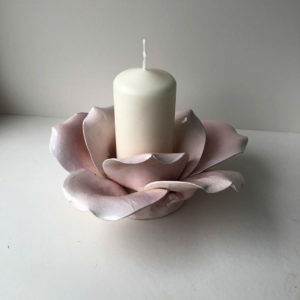 But if you learn with bone china, you will learn tricks and techniques which are paramount for the success of crack free flowers in any clay medium. Ceramic flower making started back in the days when the potteries created elaborate bone china flowers and added them to their wares. If you want to learn all about the history and see tutorials just on Bone China Flowers click here.